Developers often store confidential information in the configuration files. Database connection strings, user names and passwords are some of the examples. One of the requested feature during ASP.NET 1.x days was to provide some way to easily encrypt and decrypt such information. Thankfully ASP.NET 2.0 fulfils this request in a flexible way. This article will explain how a specific configuration section can be protected using inbuilt tool and code. How ASP.NET encrypts configuration files? If you open machine.config on your machine you will find a section that specifies these providers. The RsaProtectedConfigurationProvider is the default one. Below is the relevant markup from machine.config file. description="Uses RsaCryptoServiceProvider to encrypt and decrypt"
Windows APIs to encrypt and decrypt" useMachineProtection="true"
Let's see how we can encrypt the <connectionStrings> section using ASPNET_REGIIS.EXE tool. We simply add a connection string that points to Northwind database. Next, drag and drop a GridView control on the default web form and add the following code in the Page_Load event. We read the connection string from the <connectionStrings> section using ConfigurationManager class. We use this manual method instead of using SQL Data Source control deliberately just to prove that the inbuilt classes such as ConfigurationManager automatically decrypt the encrypted version of the connection string. We then populate a DataSet from all the records from Customers table and bind it with the GridView. aspnet_regiis -pe "connectionStrings" -app "/encrypttest"
The -pe switch specifies the section from the web.config file to encrypy (connectionStrings in our case). The -app switch specifies the virtual path of the IIS application we are working on. The tool has encrypted the connectionStrings section using RsaProtectedConfigurationProvider (default) and stored the encrypted markup back to the configuration file. You can also specify the Protected Configuration Provider using -prov switch. Easy. Isn't it? Now, run your web form. The web form should correctly display the Customers table in the GridView indicating that ConfigurationManager class automatically decrypts this information while reading the connection string. What if you need to make some changes to the connection string during the development? Don't worry! The ASPNET_REGIIS.EXE tool allows you to decrypt the section also. Just issue the following command and get back your original un-encrypted version back. aspnet_regiis -pd "connectionStrings" -app "/encrypttest"
The onlt difference between this command and the one we used previously is that we used -pd switch instead of -pa. 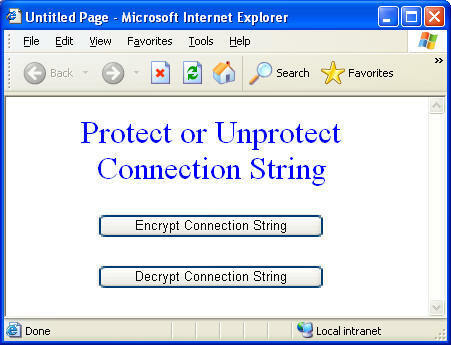 The task of encrypting and decrypting web.config can also be achieved via code. Let's see how. If you are not familiar with how to edit web.config programmatically then you may find this article useful : Modifying Web.config file programmatically. The code above is opening the web.config file for modification. It then retrieves the ConnectionStrings section. The most important thing happens at the line marked in bold. The ProtectSection() method accepts the Protected Configuration Provider you want to use for encryption and then encrypts the underlying section using that provider. The code finally saves the file back to the disk. Here, we used UnprotectSection() method to revert back to the un-encrypted version. ASP.NET 2.0 makes it easy to secure your web.config files by allowing you to encrypt them. The encryption and decryption can be done in two ways - using ASPNET_REGIIS command line tool or programmatically.